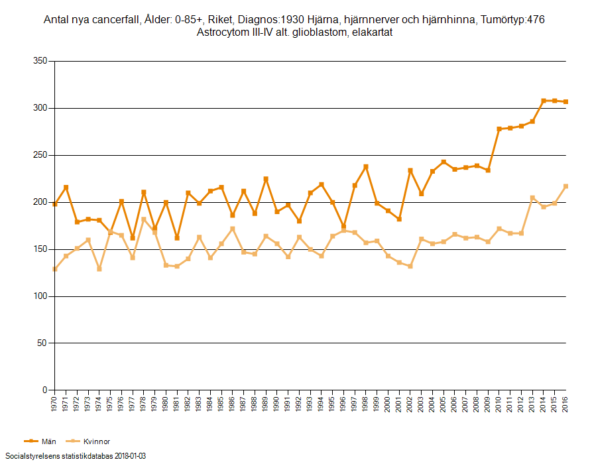 Cancers in the head and the neck are increasing in Sweden according to the latest cancer incidence data from the Swedish Cancer Registry. 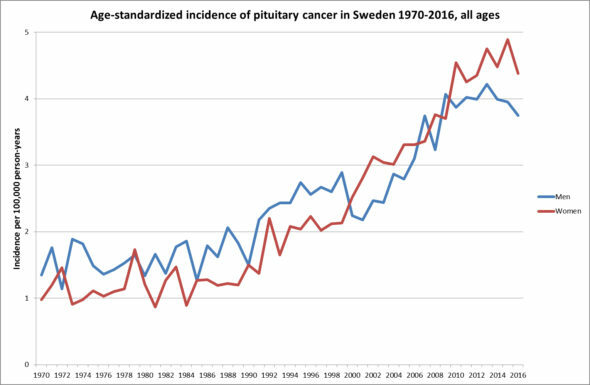 Cancers in the thyroid and the mouth are among the cancers that have seen the sharpest rise during the last decade but also the trend for cancers of the pituitary are on the rise. 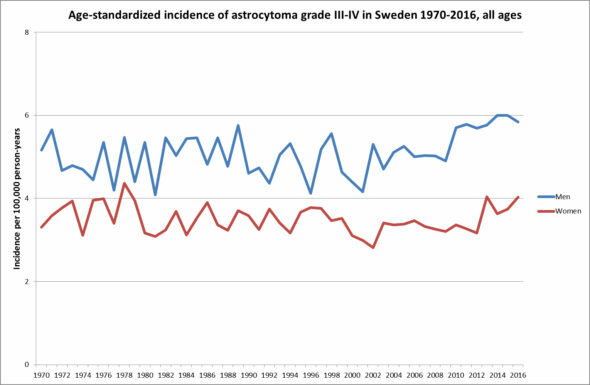 Among men aged 50 -79 years malignant brain tumours, grade 3-4 are also increasing visibly. The increase of these cancers has coincided with increasing use of mobile phones during the same time period while the increasing trend of malignant brain tumours, gliomas, might be an effect of long term use of mobile phones. 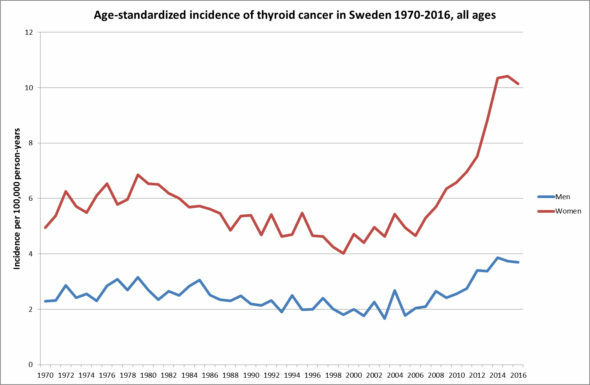 The diagram below shows the standardised incidence of thyroid cancers in Sweden 1970-2016. Women are more hit by this cancer than men. The increase among women since 2008 is over 150%. 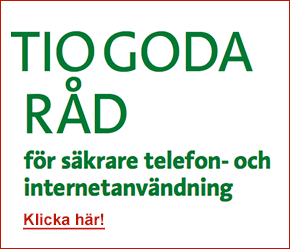 The thyroid is more exposed to mobile phone radiation since the introduction of the so called “smart phones”, that have antennas also at the bottom of the phone. 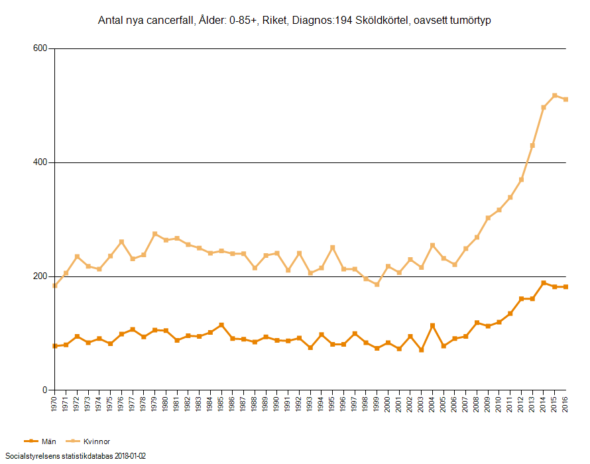 For a numbers of new cases per year of thyroid cancer please see this diagram (in Swedish). 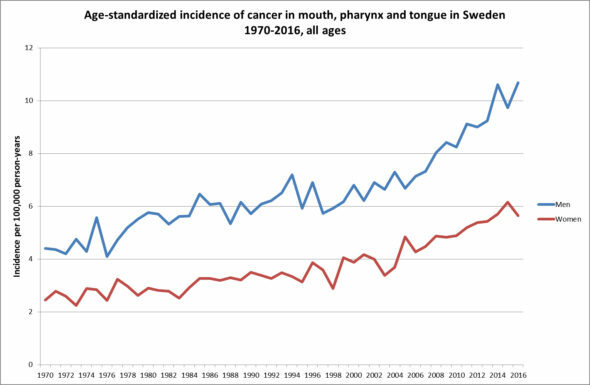 Cancers in the mouth, pharynx and of the tongue are also increasing. Men have a higher incidence than women. There is an obvious shift in the trend around ten years ago. 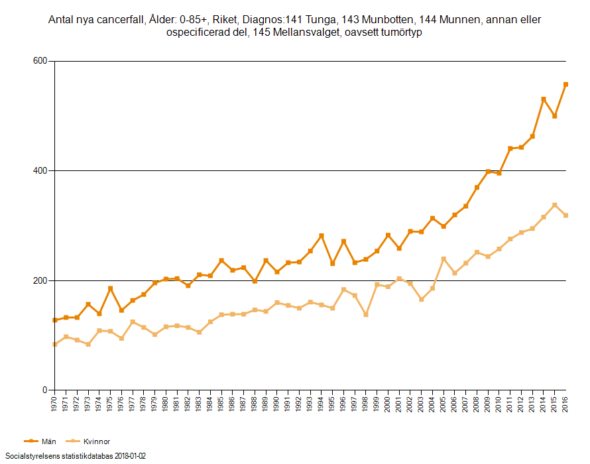 The diagram shows age standardised incidence per 100 000 inhabitants of cases for all ages from 1970 to 2016 for men and women . 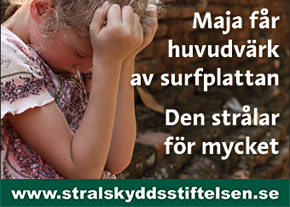 For numbers of new cases diagnosed each year, please see this diagram (in Swedish). 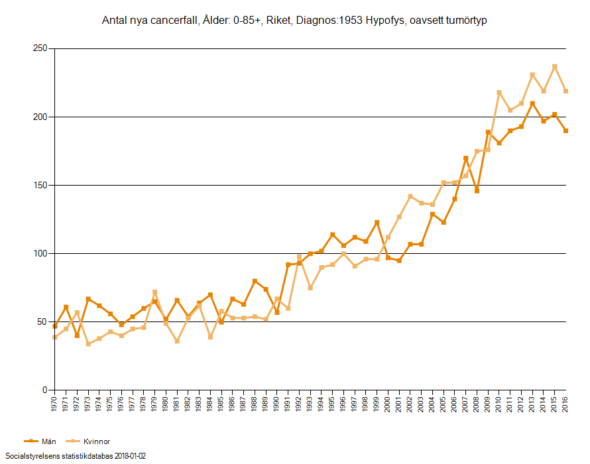 The number of patients diagnosed whith cancers of the pituitary are also on the rise. The incidence is lower than for thyroid and mouth cancers. The pituitary is also in the area that is exposed to radiation from mobile phones. The diagram below shows the age standardised incidence per 100 000 inhabitants 1970-2016 for men and women. Repeated epidemiological studies have reported an increased risk for glioma related to mobile phone use. There are four grades of glioma, 1-4. 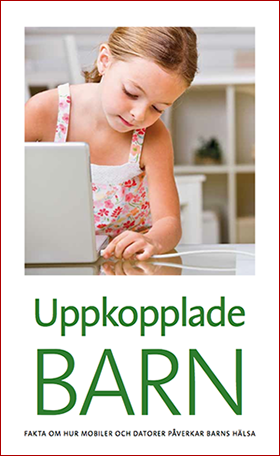 Grades 3 to 4 are the most malignant. 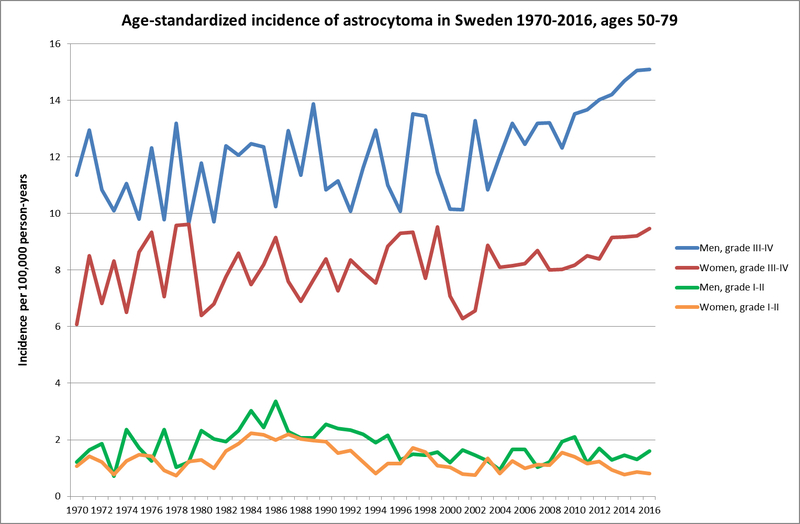 The diagram below shows the age standardised incidence of glioma grade 3 or 4 per 100 000 inhabitants from 1970 to 2016. From a relatively stable incidence among men and women, the number of new cases started to increase slightly among men around 2010 . Among men aged 50-79 years the increase of malignant glioma grade 3-4 is more pronounced. This is the age group that supposedly include the longest mobile phone users, those who were 25-55 years in the beginning of the 1990:ies. Men have a higher incidence than women. 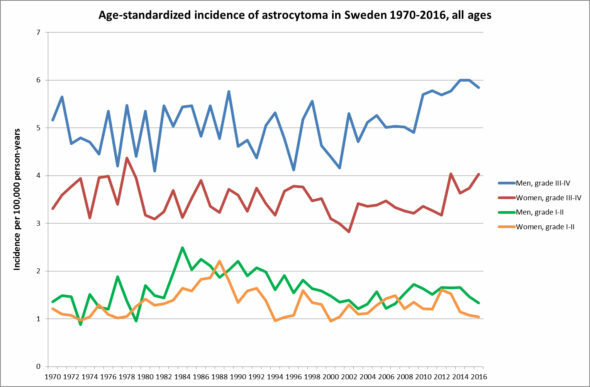 The diagram below shows the age standardized incidence per 100 000 inhabitants of glioma grade 3 or 4 for individuals aged 50-79 years. 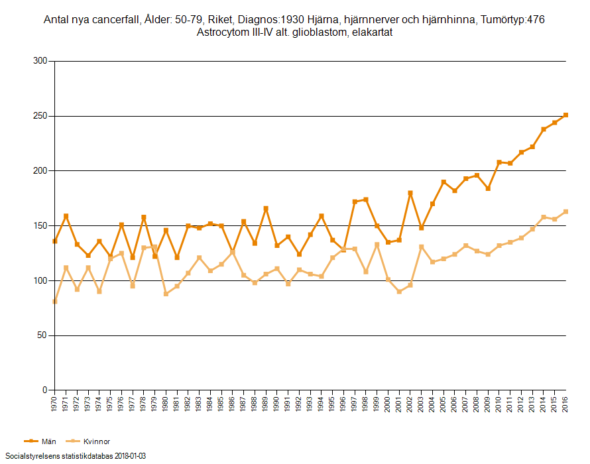 In summary the latest cancer data from the Swedish Cancer Registry shows that several cancer types in the head and neck area have increased during the last decade. 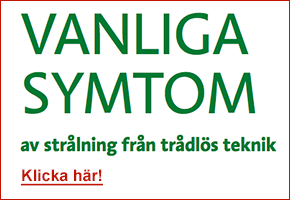 Cancers of the thyroid, in the mouth and pharynx and the pituitary. 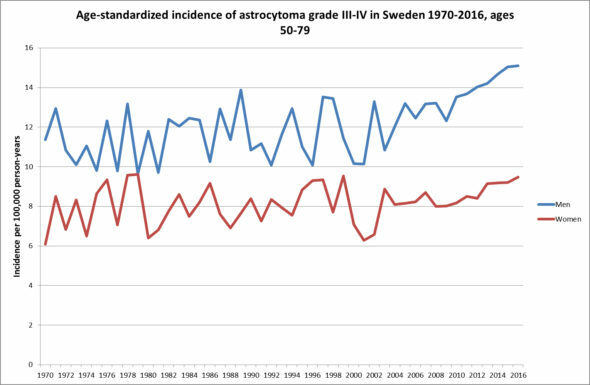 Also malignant gliomas grade 3-4 are increasing, mostly among men aged 50-79 years. The rise in the incidence of these cancers might be due to the increasing use of mobile phones, since they are in the most exposed area (the head and neck) when mobile phones are used against the head. 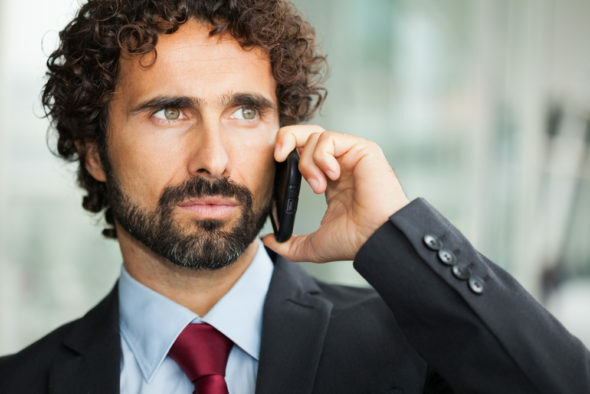 The increase in malignant glioma grade 3-4 among men aged 50-79 years might be an effect of prolonged use of mobile phones. 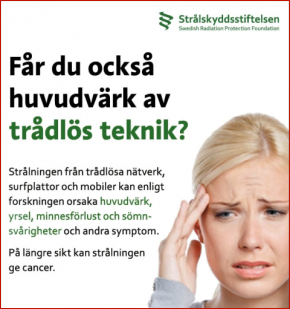 The Swedish Radiation Safety Authority and some experts with ties to industry have argued during the last years that there are no health risks from mobile phone use since there are no increased incidence in brain tumours in Swedish and other cancer registries. 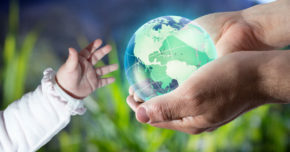 These new data shows that the argument is not only wrong from an ethical point, it is also not in line with the data. 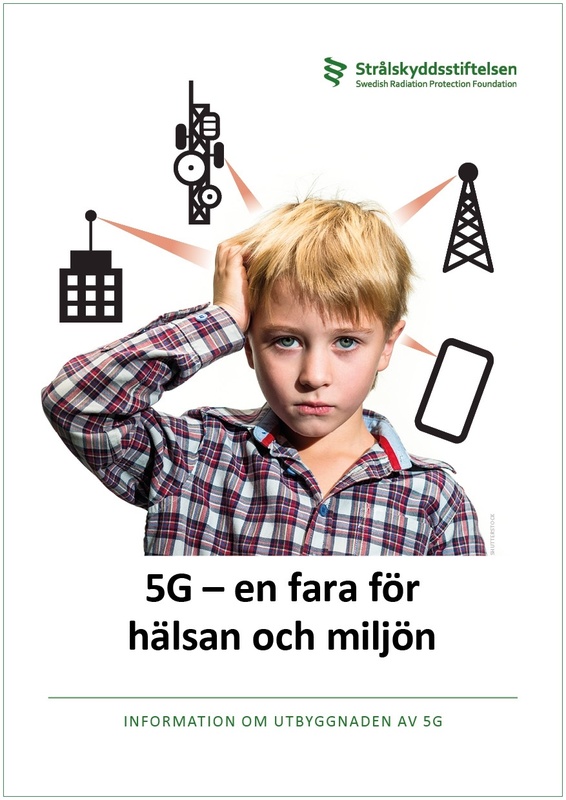 The Swedish Radiation Protection Foundation urges that the public is broadly informed about the health risks and that urgent measures to protect children and adults from health risks from mobile phone radiation are put in place, in line with the demand from over 230 scientists in EMF Scientists appeal, signed by 236 scientists.